CHILD'S MEDICAL BRACELET TO NOTIFY FIRST RESPONDERS or healthcare professionals about vital information they need to give treatment or take action. The information can be contact information or health concerns like allergies, conditions or other information like if the child is carrying an epipen CHILDREN LIKE TO WEAR THESE MEDICAL BRACELETS with our many colorful & fun designs your daughter is sure to love one of them. They are ideal for active and sporty girls as they are comfortable and strong MADE OF DURABLE 0.5" WIDE NYLON WEBBING and fitted with a plastic center push buckle to adjust the length. The wristband is long enough to fit a 6.5" wrist, but can be shortened to fit a child's wrist by cutting it shorter and melting the tip to prevent fraying ENGRAVE 4 LINES OF 18 CHARACTERS FOR FREE This gives you a maximum of 72 easily readable characters. The ID tag is 1 1/8" x 5/8 " and made from stainless steel. 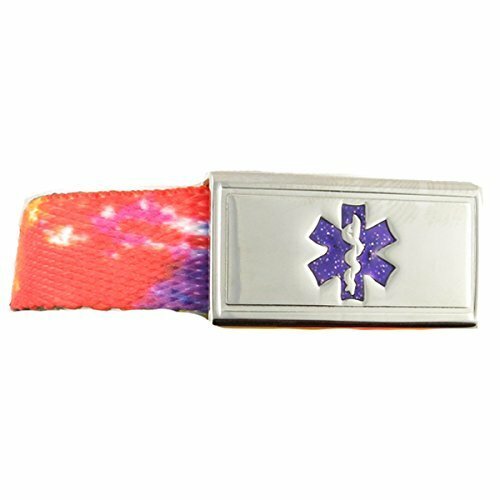 The front of the tag is engraved with an emblem to identify it as a medical tag and it can easily be flipped over to read the information. The ID tag is interchangeable with other N-Style ID Kids bands. CLICK THE "CUSTOMIZE NOW" BUTTON to add all the necessary info before adding this life saving bracelet to your cart!